Luther Dowlin was one of Trego’s closest friends and patrons in the town of North Wales. 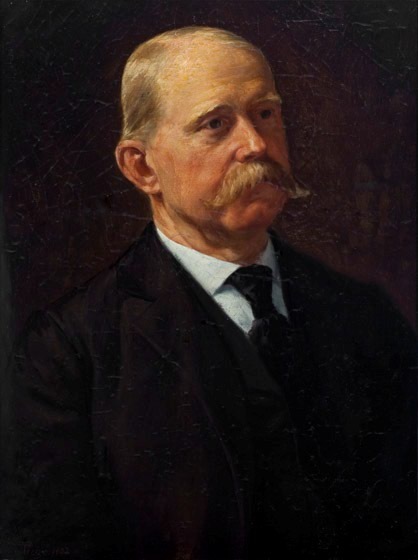 Dowlin, a printer by profession and friend of Riter Fitzgerald, the art critic for the Philadelphia Item, commissioned Trego to paint himself, his wife, Martha Anders Dowlin, and his three children in the years 1897–1904. He also purchased one military work and several genre works from William and at least one work each from both Jonathan and Delia Dexter Trego. Trego painted the portrait for Luther Dowlin. Upon the death of Dowlin, it passed to his wife, Martha Anders Dowlin. Upon her death, it passed to her granddaughter, Marie Waldron Inslee, whose children own it today. The painting was framed under glass in the 1970s and is deteriorating. It has suffered significant paint loss from the surface and is in desperate need of conservation work.